Big Sean recently kicked back at the Def Jam studios to talk about his new Pro Model, his future plans with adidas, and why the brand is so important to him. After devoting the early part of his adult life to achieving fame, Big Sean now sits in a Def Jam lounge with the presence of a seasoned veteran. He’s preparing for the release of his sophomore album, “Hall of Fame,” but the two years that have passed since his formal debut seem to have aged Sean Anderson beyond his 25 years. This isn’t the same kid that rode down a cobblestone street in SoHo atop an SUV two summers ago for a routine meet-and-greet at adidas Originals. He’s no longer wearing four heavy chains, either. The scene on Wooster Street was unexpected then, but Big Sean, now, is known. He doesn’t even need to appear in the video for his own lead single. Instead, he showcased Miley Cyrus, a starlet born into fame herself, for the artistic “Fire” visuals. There’s no need to declare his fame anymore. His maturity shines with what he doesn’t do, with his sophisticated nuances. He dropped three “Finally Famous” mixtapes before his formal debut released, but doesn’t stop to shout, “I told you so!” His jewels are still glimmering, but now the chains are tucked inside his shirt. The vibrant v-neck and matching TI$A cap are nowhere to be found on this day, replaced with a subtle red BAPE polo and a loose-fitting grey sweatshirt. There’s wisdom emanating from the Detroit wordsmith, and a clearer understanding of who he is and where he wants to be. It’s manifested in his music, but distinctly revealed in his fashion choices. He’s always allowed his style to communicate for him, and one of the most recent ways he was able to showcase his taste was in last year’s all-red “Detroit Player” adidas Pro Model. The launch and partnership had been so successful that Big Sean is already gearing up for yet another signature release, this time an all-black rendition that substitutes gold for gunmetal, releasing this Saturday, August 31st. The updated look is about his current preferences, and how he presently feels as a leader in style. Big Sean won’t say it out loud, and he chuckles at the suggestion, but there’s a sneaking suspicion that last year’s release taught Yeezy that an all-red sneaker was a good look. 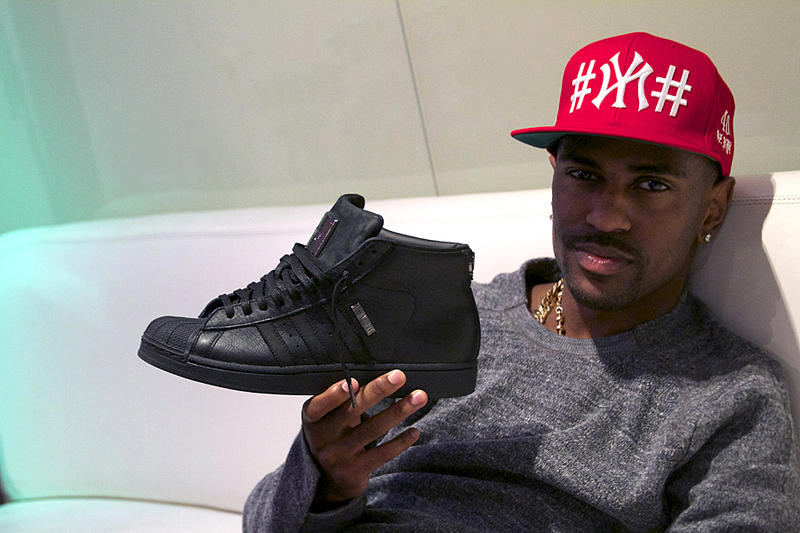 Big Sean recently kicked back at the Def Jam studio in New York City to speak with Sole Collector about his new Pro Model, his future plans with adidas, and why the brand is so important to him. Angel Navedo: When we last spoke, “Finally Famous” was on the way and you had just hopped off the top of an SUV, literally, in front of adidas Originals. What made you want to do that? Big Sean: I don’t know. I just felt like it at the time. I had never done anything like that, hopping on top of a car, but it was great. AN: Was there any indication that the turnout was going to be so crazy? Big Sean: They thought it was going to be like 500 people, and it turned out to be over 5,000. The New York commissioner came and shut us down. He was trying to charge us a $100,000 ticket. It was crazy. AN: When you were there, adidas had a Superstar with your name and “Finally Famous” branded onto it. Now you’re about to release your second Pro Model. What’s that adjustment been like now with a different sneaker to work with? Big Sean: There hasn’t been too much adjustment. It’s one of the sneakers I’ve been wearing for a while. Now I get to wear my own all-black ones. [adidas] customized it to particularly fit my tastes. It’s not like it’s a new model or anything. AN: What kinds of customizations did you want included for this version? Big Sean: We put gunmetal accents on it, as opposed to the last one that had gold accents against all the red. I wanted to try something new, man, and not just do gold again. So we did gunmetal, which I think is very fashion-forward. People are really going to start getting into more gunmetal things. AN: So, adidas is on board with the fashion-forward approach. Are there plans to take it further? Big Sean: Our relationship has really become more and more established. We’re starting to do more things, like create actual [new] shoes. And, you know, that’s the level that I want to get into eventually. I’m a fan of the Raf Simons adidas, and I’d like to get into doing that in my own way. AN: Go a bit more daring and make your own look? Big Sean: Yeah, that’s what I want to do. But I’m excited about these. It means a lot to me to be part of something involving these classic designs. AN: Beyond the gunmetal, what decisions did you make in terms of this Pro Model? 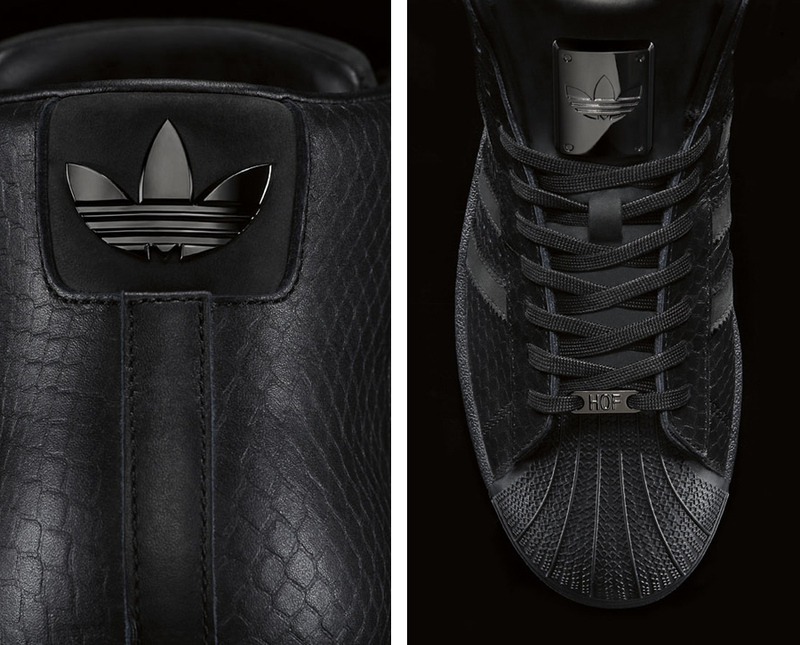 Big Sean: Oh, everything: the colors, the texture of the leather -- to make it look scaled like snakeskin. I chose the material on the tongues, and I have a map of Detroit in the shoe. This pair is the sample, but you can see the map in there. The first song on the album “Hall of Fame” is called “Nothing is Stopping You,” and in the shoe, it reads: “Nothing is stopping you.” There’s a lot of super fun and easy things we did, but this pair is very rare. They’re for collectors. AN: Last year, when the all-red “Detroit Player” dropped, there was a pretty big launch at Puffer Reds. Big Sean: Yeah, it sold out fast. They’re collectibles now. I think I saw them going for a couple thousand, and these aren’t going to be anything short of that. They’re very rare, very collectible. AN: Any specific memories from that launch? Big Sean: That was a memory in itself. Having a shoe that says “Big Sean” on it and seeing people lining up to get it. It’s crazy. AN: What was that like when you first hit the stage wearing your own shoe? Big Sean: Man, incredible. To come out to a sold-out crowd in Detroit, in an arena at that, was a monumental moment for me. Everything was going right and the city was behind me. adidas was behind me. Everybody. It was a great moment for me. AN: How would you say the Pro Model suits your style? Big Sean: It’s just classic. I feel like my style is adapting and changing. I used to wear too many colors all the time, but I’ve definitely grown up a bit more. The Pro Model is easy and not too much. It’s just enough and has everything I like in a shoe. And it’s been a part of rap music for generations. AN: Right. 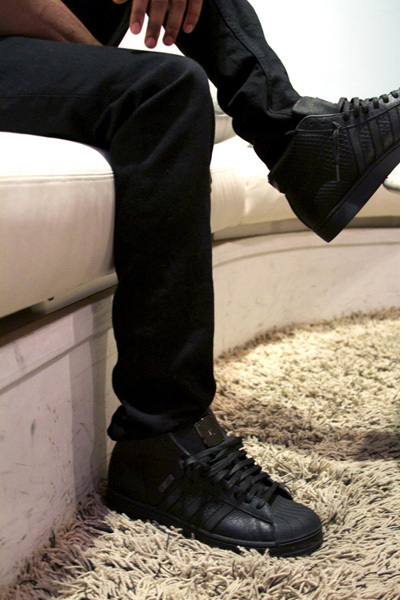 adidas has a long history in hip-hop. Run DMC brought the stripes to an international stage decades ago. What’s it like being part of that? Big Sean: [Pauses]. You know, Run DMC and Bob Marley, and a lot of these great people were heavy into adidas. I respect adidas for being one of the biggest companies in the world and still being in tune with the streets. Not only do they support me, but they support people who are considered more underground than me -- not as known and not as popular -- and they give them platforms. I respect them for that. They put money in people’s pockets. That’s the biggest thing you could do for them, to help support them financially, to help support their families. I have love for adidas for always being part of the culture, from the beginning with Run DMC to now and messing with artists like me. AN: A signature sneaker was always a dream for athletes, but now you’re on your second pair as an artist. You ever thought something like that was possible? Big Sean: Nah, man. Hell nah. I mean, ‘Ye showed me anything was possible after the Yeezy. AN: Yeah, I was thinking earlier about the “Red October” pair that we keep seeing. And you did all red last year. Is he copying you? Big Sean: (laughs) Oh, I’m going to be wearing those, for sure. He’s gotta send me those. AN: You mentioned that you have references to your music in the shoe. Any chance you’re talking about the shoe on your album? Big Sean: That’s one thing I didn’t talk about specifically, but the spirit is there. I talk about what the shoe represents, about dreams. I’m a spiritual dude, and I believe in creating realities, laws of attraction, and manifesting your own goals. That’s what I want to embody: the idea that you can create anything. AN: Family is especially important for you. too. You’ve spoken about your relationship with your grandmother. What was her reaction to you having your own sneaker? Big Sean: She just looked at it like, “Cool.” She’s very, very old now, but I know she’s very proud of me. I bought the whole family a house, and she’s living in it. She’s always been the backbone of our family and she supported us. We were all living in grandma’s house. But at her age, she doesn’t follow stuff the way we can all the time, you know? When you get to 93, it’s like, “Oh, cool, you got a shoe. Alright.” She comes from the era where people say things like, “We only had one pair of shoes growing up.” I can’t really be like, “I got my own sneaker,” when she doesn’t wear those anyway. She’s got like one pair of sneakers (laughs).